They say a picture is worth a thousand words. The name of the book Obama is reading is called The Post-American World, and it was written by a fellow Muslim. Just in case you don't get it, "Post America" means the world after America! Snopes and Truth-Or-Fiction both say this is an accurate photo. 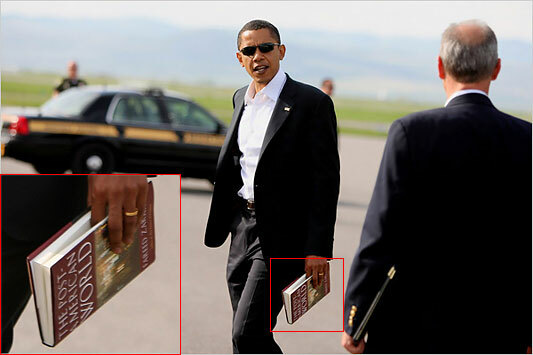 Snopes attempts to mitigate the implications of Obama reading such a book, but facts are facts and they do confirm the photo as real. I've never bought into all of that Obama is a Muslim, or where's the birth certificate rhetoric. However, leopards don't change their spots — and neither do Marxist Socialist Muslims. As I've written several times before, don't listen to what Obama, his spin-meisters, and his apologists "say." Look at what it is Obama does, and who he surrounds himself with, i.e. friends, associates and mentors... as well as what he reads. I believe America is at a crossroads in our history. If we don't get control of Congress in November, this nation as we know it is toast. This is a video clip showing a veteran who went to a Mexican restaurant in Reno, NV to take down the American flag that was being flown under their Mexican flag. This guy silenced the folks on the sidewalk and should make you proud to be an American. It's going to take a lot more of this kind of revolt to change things. Watch it here with pride. Speculation about a Rossi run began in earnest in the beginning of February, when a poll conducted by the Portland-based Republican polling firm of Moore Information, showed Murray and Rossi locked in a statistical dead heat — should he run. Bob Moore, president of the polling firm, said he added Rossi's name to an otherwise generic poll for no other reason than Rossi being probably the best-known Republican in the state. A University of Washington poll released Monday finds that Rossi, a two-time runner up to Chris Gregoire for governor, would give Murray a tough battle in November. According to that poll, 44 percent of voters sampled in the state said they would vote for Murray, while 40 percent said they'd choose Rossi. Twelve percent were undecided. The margin of error was four points. Murray, a three-term incumbent, has faced mostly unknown GOP challengers until now. Republicans at the national level have been trying for months to recruit Rossi. Meanwhile, in anticipation of an announcement — or perhaps to try and force Rossi to rethink doing it — Democrats at several levels launched pre-emptive attacks against his background and his real-estate investment dealings months ago. Murray claims she has no knowledge or involvement in those attacks, but has done nothing to indicate she would like them to stop either. “She could put an end to that with a simple phone call,” Rossi noted dryly. Rossi cited concerns over the national debt, the health care reform bill and the stimulus package as reasons he decided to jump in the race. Many consider Murray’s strong support of the Obama administration — and the controversial health care bill — to have made her vulnerable to a credible challenger such as Rossi. Volunteers can sign up on Rossi’s Web site, as well as donate money to his campaign. 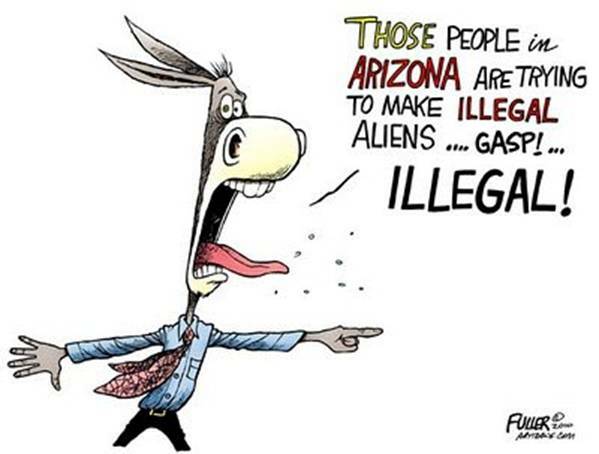 I’ve found watching liberals getting so self-righteously spun up over the Arizona immigration law to be highly amusing political theater. Seeing them falling all over themselves to condemn Arizona and calling for boycotts of the state has been a welcome diversion from other, more serious things, going on in my life. When you ask those who are so snobbishly offended if they’ve actually read the law, most openly admit they haven’t, but say all they know is that it’s racist and morally wrong. 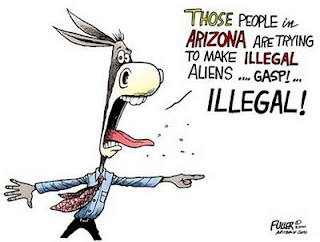 What’s funnier is watching them stammer pompously when you tell them all Arizona did was basically take the existing federal immigration law — the one the Obama administration has refused to enforce until now — and change the words “United States of America,” to “State of Arizona. 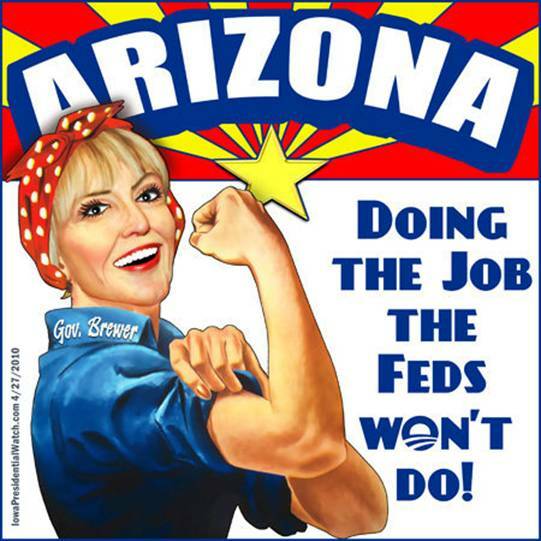 In spite of all the negative rhetoric, I think passing that law finally put heavy enough pressure on the Obama administration to act, and that’s why it sent troops to Arizona to restore order. Mr. Pierce replied, “I received your message; please receive mine. As a state-wide elected member of the Arizona Corporation Commission overseeing Arizona’s electric and water utilities, I too am keenly aware of the ‘resources and ties’ we share with the City of Los Angeles. In fact, approximately twenty five percent of the electricity consumed in Los Angeles is generated by power plants in Arizona. Personally, I find these actions pretentiously arrogant, especially considering these folks don’t personally live with the drug-related violence many Arizonans experience on a daily basis. Opponents should have been condeming the federal government for refusing to enforce the existing immigration law, not the state for protecting its citizens. Perhaps the more vocal of them should have spent a few weeks getting some up close and personal experience with that brand of violence before invoking typical liberal knee-jerk political condemnation from afar. I’m willing to bet the first time they actually came face-to-face with it, they’d quickly rethink their self-important contempt. Here are a couple of videos from a TV station in Atlanta that has taken an active interest in this issue. They may surprise you. See them here and here. How much is $100 million in relation to our total budget? A college student explains this in a very interesting way. This is worth spending one minute to watch! The class had done a great job in their selections. Both candidates were good kids. I thought Jamie might have an advantage because he got lots of parental support. Now it was Olivia's turn to speak. Her speech was concise. She said, "If you will vote for me, I will give you ice cream." She sat down. Every time Barack Obama opened his mouth he offered ice cream, and 52 percent of the people reacted like nine year olds. They want ice cream. We're now "enjoying" the ice cream Obama promised us! 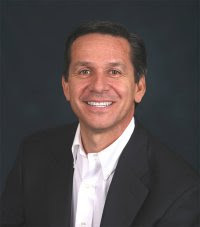 A new Rasmussen Reports poll shows Dino Rossi basically tied with Sen. Patty Murray in a hypothetical fall matchup. The survey of 500 likely voters was taken Tuesday, May 4. The margin of error was 4.5 percent. A recent Elway Poll showed Murray with a bigger advantage. Nate Silver, who runs the FiveThirtyEight website and is something of a rock star to poll geeks, weighed in on the Ross-Murray situation Wednesday.